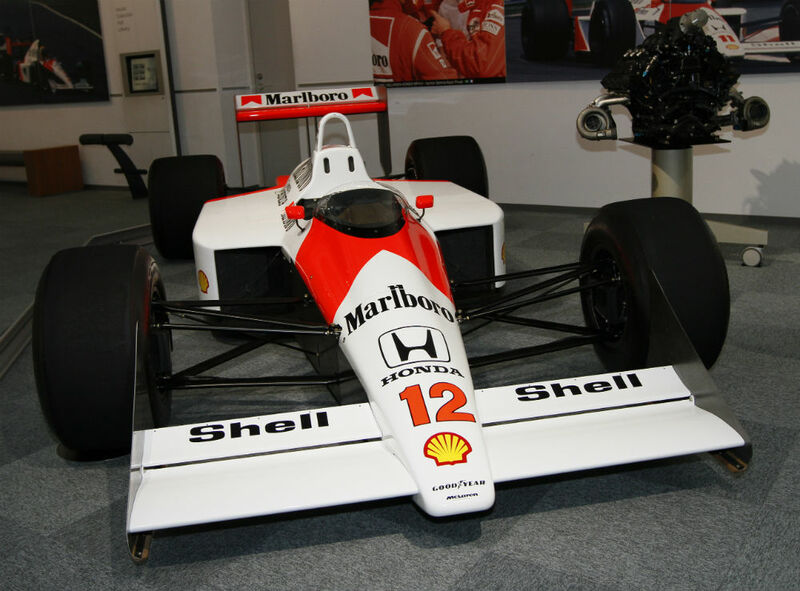 Race for race, the McLaren MP4/4 is the most successful F1 car of all time! Then again, it could not have had two more able drivers. Ayrton Senna and Alain Prost were the pick of the paddock - and among the crème de la crème in the whole history of motorsport. Throughout the 1988 season, the pair extracted the max from the MP4/4. Well, almost! Between them, they won 15 times from 16 starts - with just the Italian GP eluding them. Senna was bamboozled by a back-marker - and with Prost also out, victory at Monza was not to be. McLaren began the '88 campaign with mixed emotions. In the plus column, they had secured Honda as an engine supplier. The year before, the Japanese giant had helped arch-rivals Williams win the World Championship. But, in the minus column, McLaren had lost ace designer John Barnard. Given that he had sculpted every McLaren since '81, he would inevitably be sorely missed. Steve Nichols and Neil Oatley stepped up to the high-tech plate Barnard had vacated. The previous year's car - the MP4/3 - had been powered by Porsche. The new Honda engine was also a V-6 - so similarly configured. That allowed Barnard's replacements to stick with the tried and trusted aerodynamics of the MP4/3. The only visible change was a narrower cockpit. '88 would be the last hurrah for turbocharged engines. The F1 powers that be had decreed that henceforth they would be banned. Notwithstanding, Honda in no way shirked their responsibilities. They wrung every last drop out of the soon to be obsolete engine. Indeed, they provided two versions - the XE2 and XE3 - to be toggled according to circuit layout. Possibly as a result of all this extra preparation, Mclaren were late for pre-season testing. If that caused their rivals to chuckle, the mirth was short-lived. McLaren finally fired up the new engines - and sent the cars out. In short order, they had laid waste to the opposition! Come the first race - and it was simply more of the same. McLaren dominated in every department - as testified by that near-perfect score at the end of the season. Senna and Prost were nigh on unbeatable that year ... stymied only by that unyielding back-marker, at Monza. So, the McLaren MP4/4 was the greatest GP car ever ... well, statistically-speaking, at any rate!